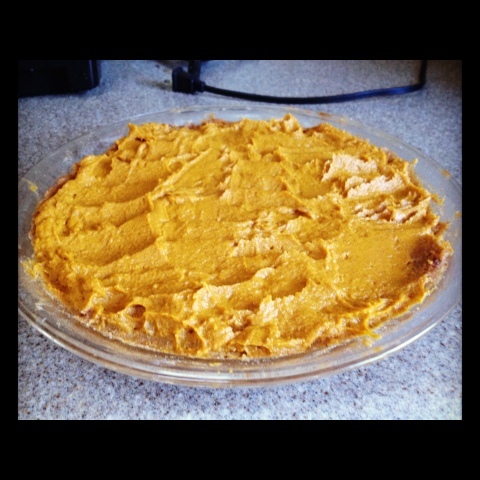 Keep it clean this Thanksgiving with a Raw Pumpkin Pie, yeah I said it RAW! This no bake treat is super easy, is REAL, gluten free, dairy free, egg free, sugar-free!! 1. In your Vitamix, blend your almonds with 1/4 c water so they are ground(can be pretty thick). 2. Clean out Vitamix, then place a tub of dates (pitted dates) with 1/2 c water. 3. Spoon out about 1/3 of date paste in to a clean small bowl, leave 2/3 in Vitamix. 4.mix almonds and date paste. 5. Remove new almond/date paste from Vitamix and flatten out in pie pan. 6. In Vitamix blend leftover 1/3 of date paste, almond milk, spices, vanilla, and pumpkin. 7. Pour mixture in to pie pan.